Ah kids. As I promised in last weeks post of finding new ways to sellout in year 3 of IBBB I have not disappointed. Well, maybe a little. Yours truly (that would be me) has left my footprint on The Hills. 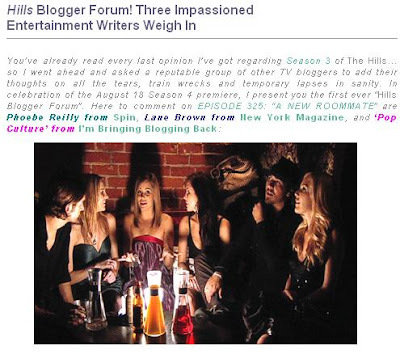 IBBB was contacted by the MTV blog to answer some questions in my typical jackass fashion on past Hills crapisodes. And as quickly as Lisa Loveless can comb her stringy hair, I jumped on the opportunity. Please note, that there were 3 people who contributed to this. 1. A writer from Spin Magazine. 2. A writer from NY Magazine. 3. IBBB. That’s right Mo’ Fo’s I was good enough. You know those other two writers are pissed I was included. Traded down for them! I will now sit back patiently and wait for the offers to pour in. I will push Best Week Ever to the top of the list. Followed by Chelsea Handler/Chelsea Lately. Followed by probably being knighted by the Queen. Crickets. Crickets. Crickets. So, be sure to check out The MTV Blog by clicking here and show your love for their site and for my brilliant comments. There will be 3 more crapisodes in the next 3 weeks which I’ve provided my insight to. Stay tuned. *Your’re Greeeeeeeat has no affiliation with Tony the Tiger.